Tropical cyclones can become post-tropical before they dissipate, meaning they can become sub-tropical, extra-tropical or a remnant low pressure area. As Tropical Cyclone Gelena transitioned into a subtropical storm, NASA’s Aqua satellite provided a visible image of the storm. On Feb 15 at 10 p.m. EDT (Feb. 16 at 0300 UTC), the Joint Typhoon Warning Center or JTWC noted that Gelena had already become subtropical. JTWC issued their final warning on Gelena. At that time, the storm had maximum sustained winds near 40 knots (46 mph/74 kph). It was centered near 29.8 degrees south latitude and 89.3 degrees east longitude. That’s 1,426 nautical miles east-southeast of Learmonth, Australia. Gelena was moving east-southeast. What is a Post-tropical Storm? A Post-Tropical Storm is a generic term for a former tropical cyclone that no longer possesses sufficient tropical characteristics to be considered a tropical cyclone. Former tropical cyclones that have become fully extratropical, subtropical, or remnant lows, are three classes of post-tropical cyclones. In any case, they no longer possesses sufficient tropical characteristics to be considered a tropical cyclone. However, post-tropical cyclones can continue carrying heavy rains and high winds. What is an Extra-tropical Storm? 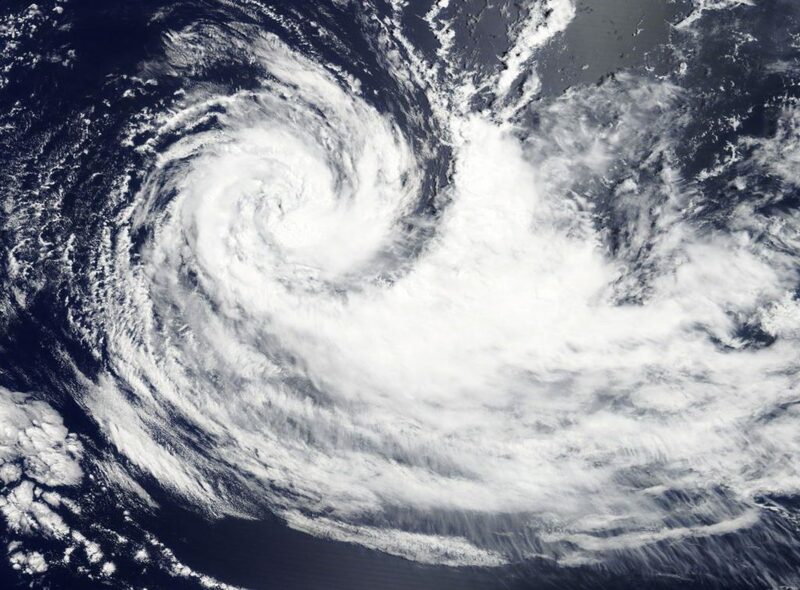 Often, a tropical cyclone will transform into an extra-tropical cyclone as it recurves toward the poles (north or south, depending on the hemisphere the storm is located in). An extra-tropical cyclone is a storm system that primarily gets its energy from the horizontal temperature contrasts that exist in the atmosphere. Tropical cyclones have their strongest winds near the earth’s surface, while extra-tropical cyclones have their strongest winds near the tropopause – about 8 miles (12 km) up. Tropical cyclones, in contrast, typically have little to no temperature differences across the storm at the surface and their winds are derived from the release of energy due to cloud/rain formation from the warm moist air of the tropics. Visible imagery from NASA’s Aqua satellite revealed Gelena’s subtropical transition. 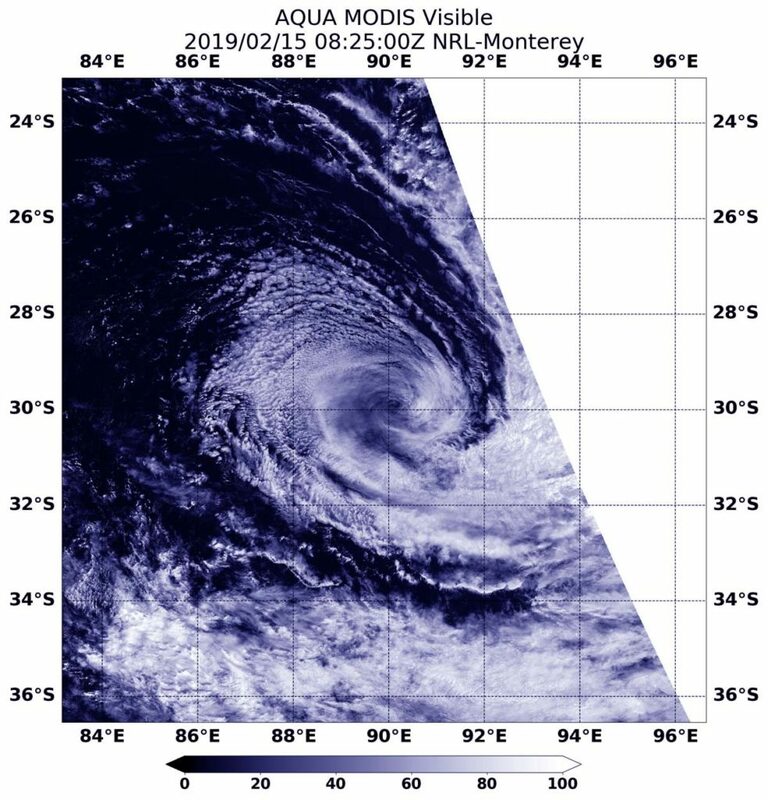 At 3:25 a.m. EDT (0825 UTC) on Feb. 15, 2019, the Moderate Resolution Imaging Spectroradiometer or MODIS instrument aboard NASA’s Aqua satellite provided a visible image of subtropical storm Gelena in the Southern Indian Ocean. The MODIS image showed Gelena had a closed surface wind circulation about a well-defined center, but the storm has become asymmetric (as subtropical storms do). Gelena is expected to continue moving through the Southern Indian Ocean over the next day until it dissipates. 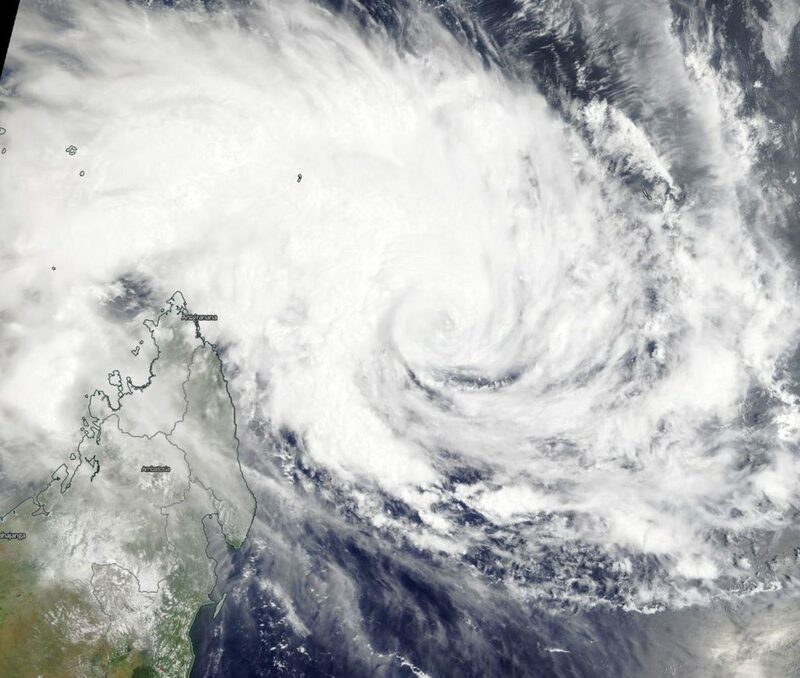 Tropical Cyclone Gelena is being battered by outside winds, and that’s weakening the storm. Visible imagery from NASA’s Aqua satellite revealed the bulk of clouds in Tropical Cyclone Gelena were pushed away from the center. 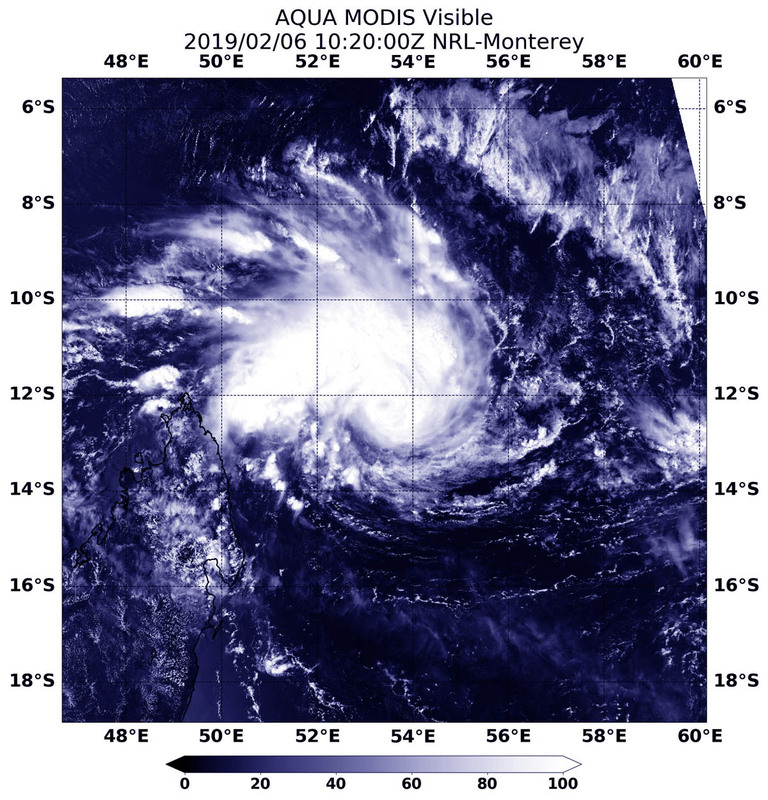 On Feb. 14, 2019 at 2:45 a.m. EDT (0745 UTC) the Moderate Resolution Imaging Spectroradiometer or MODIS instrument aboard NASA’s Aqua satellite captured a visible image of Tropical Cyclone Gelena in the Southern Indian Ocean. The image showed Gelena’s clear low level center of circulation, and the bulk of the tropical cyclone’s clouds pushed south of the center. That’s because of strong northerly wind shear. In general, wind shear is a measure of how the speed and direction of winds change with altitude. Wind shear can tear a tropical cyclone apart or weaken it. On Feb 14 at 10 a.m. EDT (1500 UTC), Gelena’s maximum sustained winds were near 40 knots (46 mph/74 kph). It was centered near 28.6 degrees south latitude and 86.6 east longitude. Tropical Cyclone Gelena is approximately 1,474 nautical miles south-southeast of Diego Garcia, and has tracked east-southeastward. The Joint Typhoon Warning Center expects Gelena to dissipate in 24 hours as it continues to face strong vertical wind shear and moves into increasingly cooler sea surface temperatures. Visible imagery from NASA’s Terra satellite showed a weaker Tropical Storm Gelena far from land areas, and in the middle of the Southern Indian Ocean. 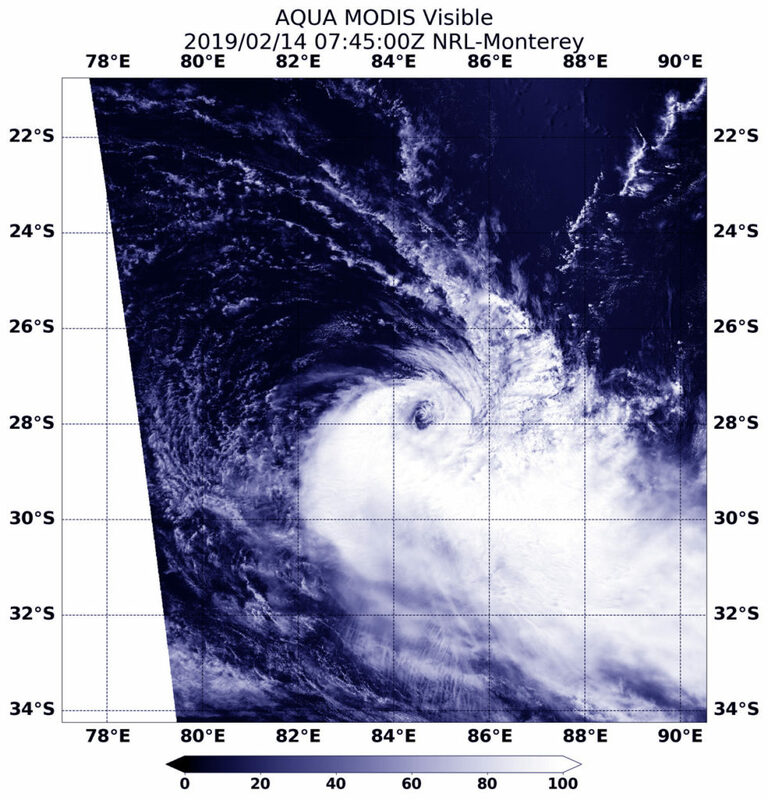 On Feb. 13, 2019 the MODIS instrument aboard NASA’s Terra satellite provided a visible image of Tropical Cyclone Gelena in the Southern Indian Ocean that showed bands of thunderstorms spiraling into the center. Credit: NASA Worldview, EARTH Observing System Data and Information System (EOSDIS). On Feb. 13, the Moderate Resolution Imaging Spectroradiometer or MODIS instrument aboard NASA’s Terra satellite provided a visible image of Gelena. The image showed bands of thunderstorms spiraling into a cloud-filled, but defined low level circulation with the bulk of its associated convection and clouds pushed eastward from westerly winds. At 10 a.m. EDT (1500 UTC) on Feb. 13, the Joint Typhoon Warning Center or JTWC noted that Oma had maximum sustained winds near 55 knots (63 mph/102 kph). It was centered near 26.0 degrees north latitude and 79.2 degrees east longitude. That’s 1,193 nautical miles east-southeast of Port Louis, Mauritius. Omi was moving east-southeast. JTWC has forecast Gelena to continue moving southeastward and weakening to dissipation in two days. 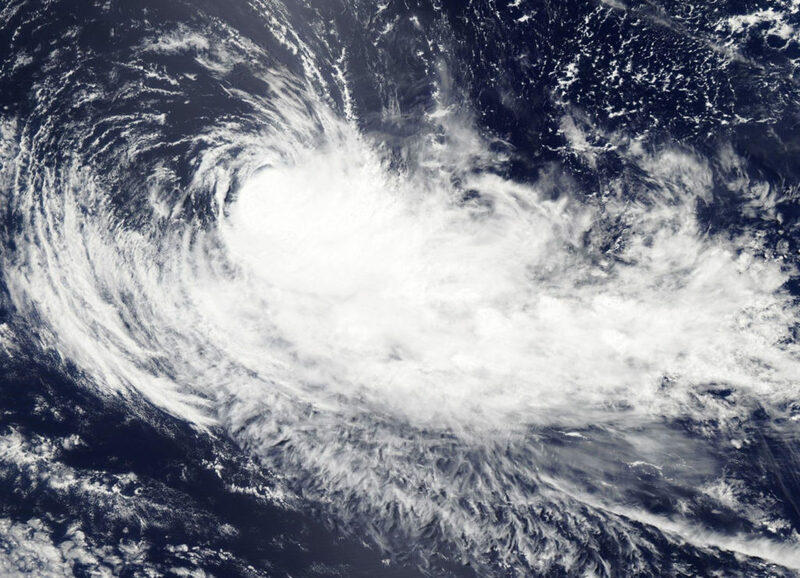 Wind shear can push tropical cyclones apart and satellite imagery from NASA-NOAA’s Suomi NPP satellite revealed that is what is happening to Tropical Cyclone Gelena in the Southern Indian Ocean. In general, wind shear is a measure of how the speed and direction of winds change with altitude. Winds at different levels of the atmosphere pushed against the cylindrical circulation center and skewed it, weakening the rotation. 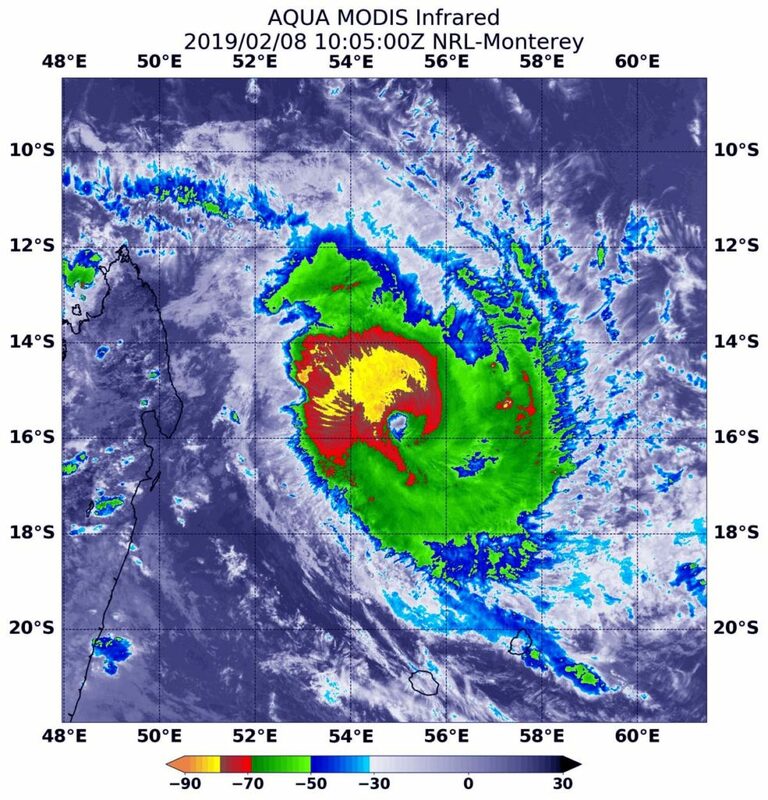 On Feb. 12 at 4:18 a.m. EDT (0918 UTC) the Visible Infrared Imaging Radiometer Suite (VIIRS) instrument aboard NASA-NOAA’s Suomi NPP satellite captured a visible image of Tropical Cyclone Gelena moving through the Southern Indian Ocean. The Joint Typhoon Warning Center noted that: “Animated multispectral satellite imagery shows a system with a mostly exposed low level circulation and its associated convection sheared eastward.” The clouds are being pushed eastward by strong westerly winds. On Feb. 12 at 10 a.m. EDT (1500 UTC) Gelena’s maximum sustained winds were near 50 knots (57 mph/92 kph) and weakening. Gelena was located approximately 961 nautical miles east-southeast of Port Louis, Mauritius. The tropical storm is moving to the east-southeast. Because Gelena is expected to move over cooler sea surface temperatures and the wind shear is expected to persist, the storm is forecast to dissipate in two days. Visible imagery from NASA’s Aqua satellite revealed the effects of wind shear on Tropical Cyclone Gelena in the Southern Indian Ocean. The storm weakened to a tropical storm. 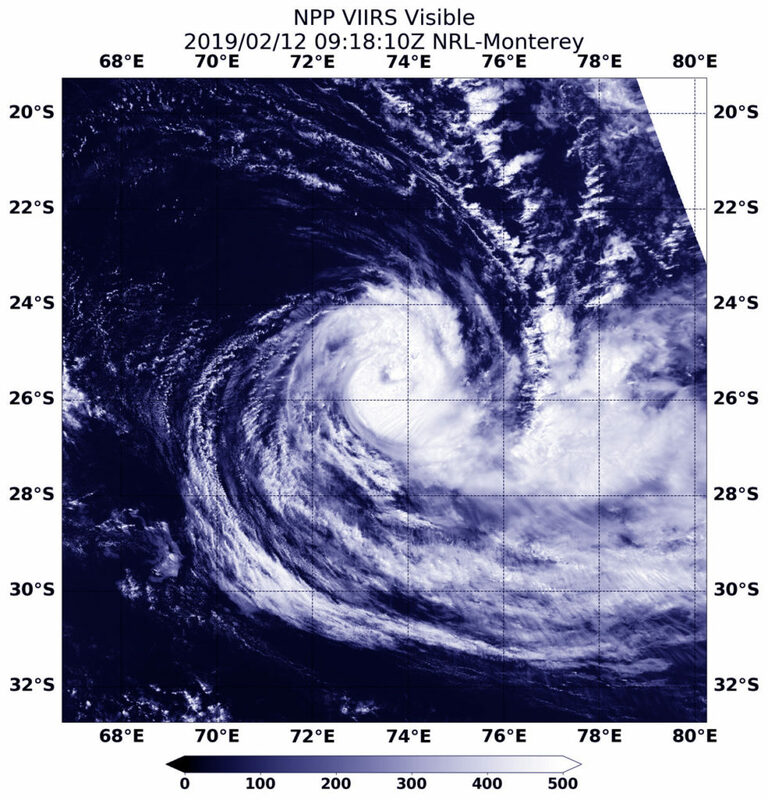 On Feb. 11, 2019, the Moderate Resolution Imaging Spectroradiometer or MODIS instrument aboard NASA’s Aqua satellite captured a visible image of Tropical Cyclone Gelena. Westerly wind shear pushed the bulk of clouds and storms east of the center. Wind shear is a measure of how the speed and direction of winds change with altitude.